Mud Mania: A Celebration of Adobe is one part learning about the oldest and most common building material known to man and one part, well, playing in the mud. Parents and their children are invited to learn about adobe at Rancho Los Cerritos’ “down and dirty” mud-centric event, a tradition since 1994, that promises to be as wacky as it is educational. On Sunday, August 17 from 12:30PM to 4:30PM at the Rancho Los Cerritos Historic Site, break the mold—or rather, make a mold—with a little adobe between your toes. Guests (and by that we mean not just the kids) will have the chance to make real adobe bricks, plaster a wall with mud, construct a mini-adobe home, compete in mud relay races and participate in many other muddy activities as they learn about the local adobe soil and its many uses throughout history. The Rancho Los Cerritos was built 170 years ago in 1844 out of sun-dried adobe blocks made of sand, clay, water and straw and Mud Mania will give parents and children the chance to squish and stomp just such historical materials in an adobe pit. 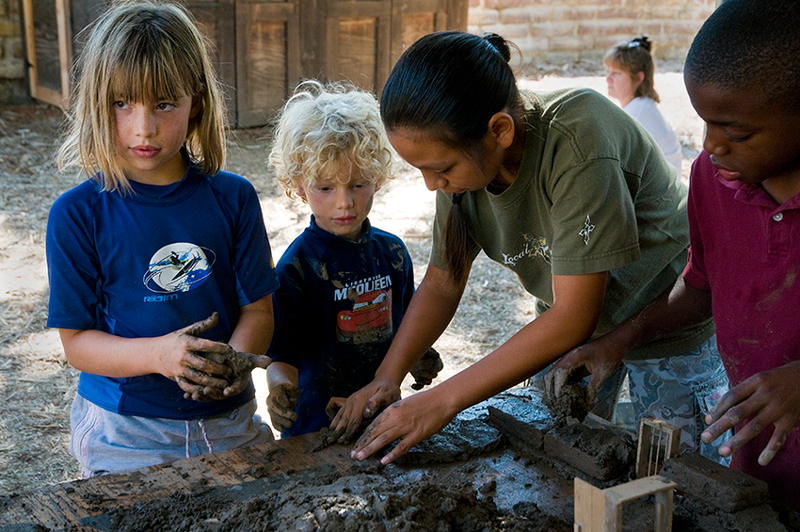 Participants can also dig through the adobe soil in Rancho Los Cerritos’ archeology lab, where treasure hunters young and old can uncover lost artifacts from bygone years, like kitchen pottery fragments, metal cutlery and bones from the cattle and sheep that once roamed the 27,000 acre ranch. Participants can also see and touch different insects that call the Rancho soil home, make a clay pot, and compete in mud-related games. Grasslands, a Southern California bluegrass band, will perform live to set a mud-jaunting mood if guests aren’t already ecstatic enough about getting to play like a kid again. The B&R Old Fashion Burgers food truck will be on site to help fuel energy-depleted parents and kids alike. For those sticks-in-the-mud who are not so keen on getting dirty, plenty of “clean” activities including fossil making, trivia and paper crafts will be offered. The organizers ask that one parent bring no more than six children. Guests are encouraged to wear old clothes and bring a towel and a change of clothes for the drive home.“De-mudding” stations will also be available for clean-up, although showers will not be available. Admission is $7 for adults, $5 for children ages 4-12; 3 and under are free. For more information please call (562) 206-2040, or visit the Rancho Los Cerritos website. Rancho Los Cerritos is located at 4600 Virginia Road.